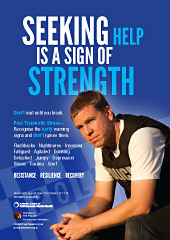 Admitting you have post traumatic stress and then getting treatment can be difficult and frightening. It can be overwhelming and difficult to admit that there is something wrong. But by taking the first steps in seeking help, you begin a road to recovery. A good place to start is to see a GP. They can help determine if there is a problem, and what might be the best approach. If things aren’t improving… see your GP. But remember, not everyone who experiences a traumatic event develops PTSD. Once you are diagnosed with post traumatic stress, there are activities that can help you perform your daily activities. These activities produce the best results, when they are done daily. Relaxation helps to calm and lower the hyper alert state that is a symptom of PTSD. Relaxation is also helpful for aiding people sleep. Eating junk food can enhance depressive moods and lethargy. By eating healthy foods, such as bananas, you are able to stimulate beneficial chemicals, such as serotonin, that improve your mood. People with chronic post traumatic stress can have problems with their working memory. Regular exercise is a good way of preventing and stimulating chemicals that aid in memory functions. You might be surprised to know that certain parts of the brain (e.g. hippocampus) are stimulated to make new connections when you exercise. A good type of exercise that can be enjoyed by all is Tai Chi, which also includes relaxation techniques. Medication shouldn’t be your only treatment, but in some cases is necessary. Instead, treatment should also, or primarily, include psychotherapy. Examples of beneficial psychotherapy include exposure therapy, and cognitive behaviour therapy (e.g. Mood Gym). 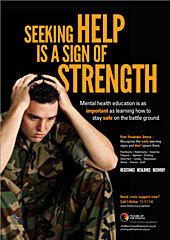 Living with post traumatic stress can severely impact on your quality of life. It is important to regain this quality of life by taking up activities that you once enjoyed, or new activities that you might enjoy. This should be done slowly and gradually, so as not to push yourself too hard. The aim is to have fun, relax and enjoy good company! You might consider going to art, music, cooking or dance classes. Alternatively, you might decide to start playing chess or join a team sport. The choice is up to you. 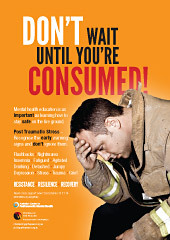 By participating in these activities you are breaking the cycle of PTSD symptoms – avoidance and withdrawal. For more information about organisation that you can contact, visit the Australian Centre for Posttraumatic Mental Health (ACPMH) website. After things have settled down you should make an appointment to see your health professionals, so you can stop things going wrong in the future.